How do I compare the course average data table with an assignment, section, or student filter in Analytics Beta? 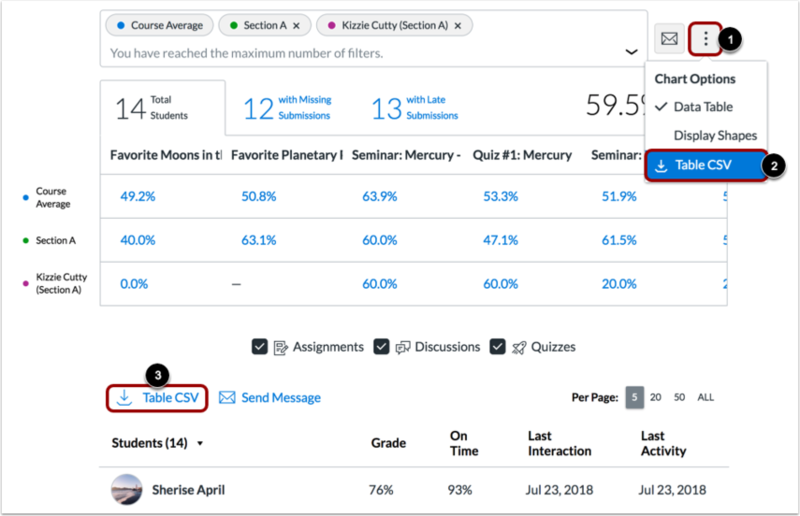 As part of viewing the average course grade in a data table, you can use filters to compare section, student, and assignment results with the course average. Click the Filter field . Type the name of a section, student, or assignment . Canvas will autopopulate all matching results. When the item displays in the menu, click the item name . You can also click the Filter field and use the scroll to locate and select a section, student, or assignment. To add another filter, locate the additional filter. The Filter field supports up to three filters. The Course Average filter cannot be removed. By default, analytics selects all assignment types to display within the page . Each assignment in the table displays the results for each selected assignment type. To view additional assignments within the filtered results, scroll within the table . To filter by assignment type, remove the checkbox next to the assignment type. The table dynamically updates the results based on the assignment type selected or removed in the filter. The added filter displays in the analytics results. Each filter is identified by a specific color. Each filter and color are displayed on the side of the table. Each filter displays its data on a single row. When viewing filters, the default shape for each color is a circle, but you can choose to enable shapes for improved contrast by clicking the Chart Options icon  and selecting the Display Shapes option . By default, assignment data displays comparisons for all students . However, you can also filter tabs to see assignments with missing submissions  and assignments with late submissions . To view specific data for a specific result, click the data percentage in the table. In a section comparison, details provide additional metrics for the section name, assignment name, assignment due date, average grade for the assignment, low and high grades by percentage, and number of missing and late submissions. The percentage bar includes a tooltip that displays the number of students who achieved the average grade . To send a message to all students in the section, click the Message icon . When comparing sections, you can also view submissions by status: missing and late. To view the names of students within each status, click the link for the status . 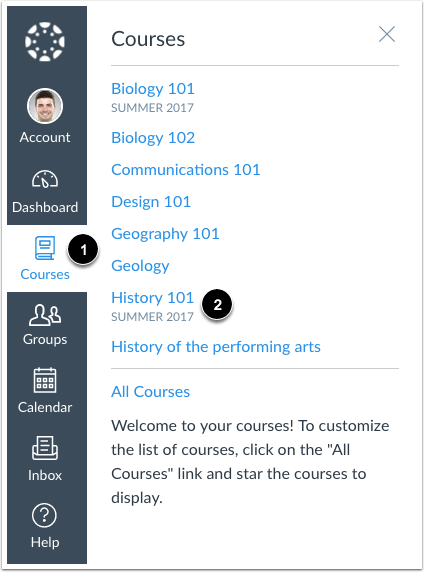 The card displays the student information for the submission statuses, including the names and last login date for each student . To message these students specifically, click the Message icon . To export the submission status list as a CSV file, click the Full List CSV link . In a student comparison, details provide additional metrics for the students full name, last access date, overall course grade percentage, assignment name and due date, the students grade for the assignment, and the status of the assignment and submission date. To send a message to the individual student, click the Message icon. Previous Topic:How do I compare the course average chart graph with an assignment, section, or student filter in Analytics Beta? 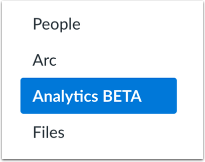 Next Topic:How do I send a message to all students based on specific course criteria in Analytics Beta? Table of Contents > Course Grade > How do I compare the course average data table with an assignment, section, or student filter in Analytics Beta?